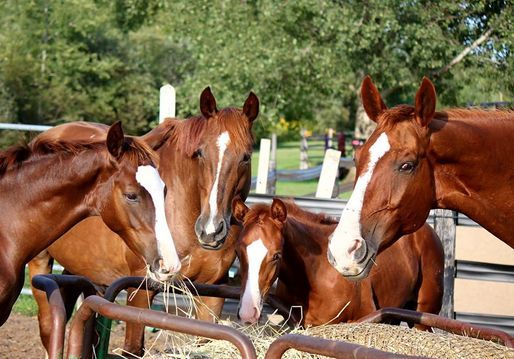 Our broodmares are a wonderful group of mares. 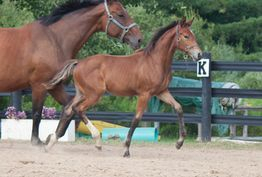 We breed for amateur friendly temperaments with exceptional pedigrees and movement. 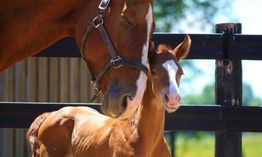 Our mares enjoy large paddock turn out and a leisurely life together, while receiving the best feed and care to ensure healthy mares and safe foal development. 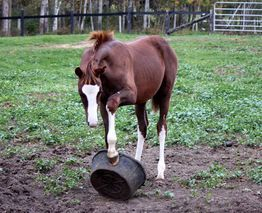 All of our foals are handled daily from birth, receive their vaccinations and deworming, and are evaluated shortly after birth by a farrier who specializes in foal growth and development. 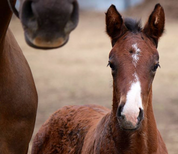 We want our foals and young horses to be easy to handle by their new families, so we ensure constant handling, picking up feet, grooming, learning to tie and/or cross tie, trailer loading, and handling by vets/farriers. While still with their mothers we regularly stable them overnight, and after they're weaned we continue to stable them overnight until they are yearlings to ensure they are comfortable in stalls. 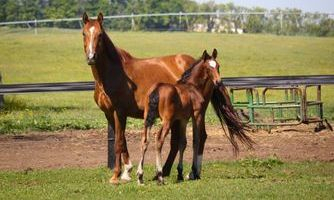 We try and make the weaning process easier by having the mares and foals in paddocks beside each other, so they can see each other over the fence during weaning, and have found this reduces the stress and anxiety for all of them. We have had many happy customers who have reported to us how easily their youngster has adapted to their new environment and routine. Wruby is our latest addition to our group of lovely ladies! 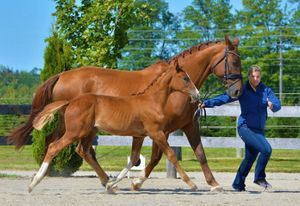 She is a 2009 16.2h liver chestnut Hanoverian mare by Wellesley out of an elite Hanoverian mare by Rotspon/Federalist. 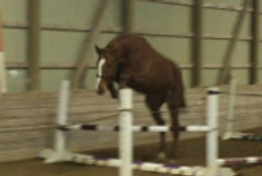 She has a lot of suspension, a beautiful elastic trot, and an active hind end. Wruby is typey and athletic, with a gorgeous head, and sweet easy personality. She is sure to be a valuable addition to our breeding program. 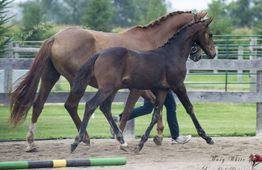 She is approved for breeding with the Hanoverian Verband. 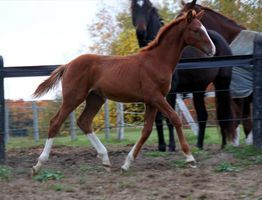 Wruby delivered her first foal in May 2016 who is a gorgeous filly by Sagnol (Sandro Hit/LaBelle), big bodied but elegant foal who has been sold to a dressage home in California. 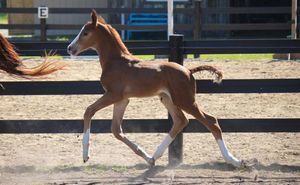 Wruby's first foal made the prestigious call back ring for top dressage foals at her large inspection, placing 3rd in a group of over 25 foals. 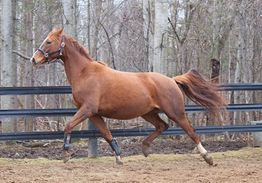 Wruby is in foal to Quaterhall for a May 2019 foal, which has been sold in utero. Wruby's first foal by Sagnol (Sandro Hit/La Belle) a 2016 filly! 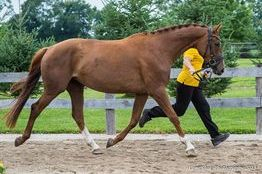 Wruby's 2018 colt by Quaterhall sold to an amateur dressage rider. 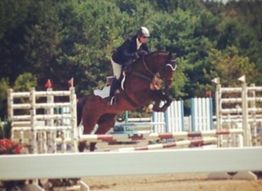 Godiva WSH 2010 mare by Glorioso Noir approved for breeding with the Hanoverian Verband. 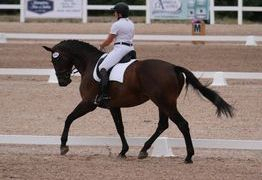 In her first year competing as a 4 year old Godiva won 9/10 dressage classes she entered, and was season champion with scores as high as 75.5%. As a 5 year old she was also season champion at first level, and is currently 6 years old and showing second level with fantastic results! 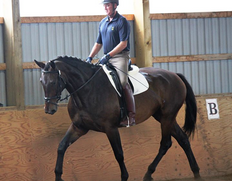 Godiva WSH is being retained by Williams Sport Horses for sport and broodmare purposes. 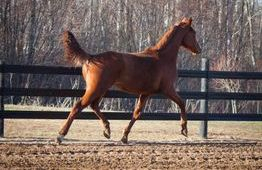 Goldwyn WSH 2011 gelding shown here as a yearling, sold to a fantastic amateur home, started easily by his amateur owner. 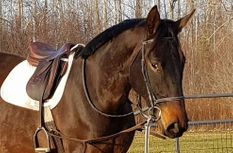 Gold Digger is a tall 17.2h Hanoverian mare by Glorioso Noir out of Monika by Merlin. 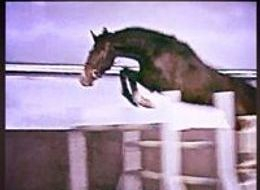 Gold Digger shows great free jumping form and natural talent, along with above average gaits. 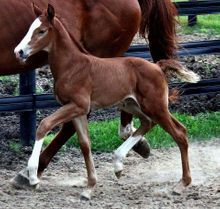 She consistently produces foals that are correct, elegant, flashy and eye catching. 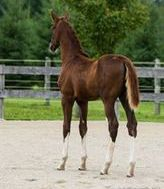 Her foals have sweet personalities and are very easy to work with and amateur friendly. 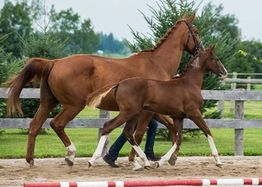 Gold Digger had a spectacular foals in 2015 and 2017 by Quaterhall, the 2015 one receiving high praise at her Hanoverian inspection with comments from the judges about her having one of the best trots of the day, and she made the call back ring for top dressage foals out of a large group of 20 foals. 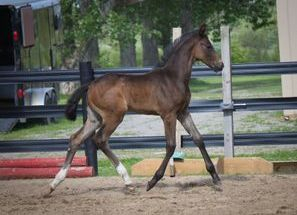 Her 2017 filly by Quaterhall also made both the call back ring for dressage and hunter suitability, placing 3rd in both in a large group of over 25 foals. 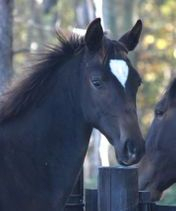 She has had two foals for us by For Edition, For Fremont and Forget Me Not, and a few foals prior to her joining us. 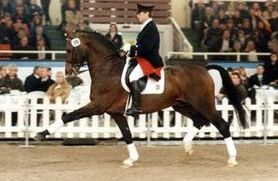 Gold Digger is approved for breeding by the Hanoverian Verband. 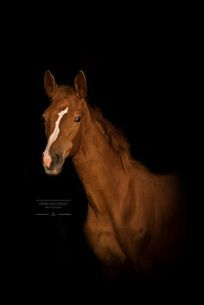 Gold Digger is sold and will continue to produce some lovely foals for her new owner! 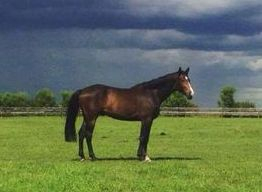 Forget Me Not by For Edition, 2014 mare sold to a fantastic jumper home in Ontario. 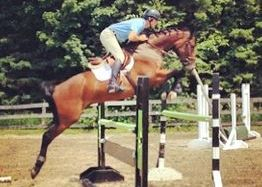 This mare has been recently started by her amateur owner and has been very easy to start. Quarterhall colt born in 2016, sadly this little man had to be humanely euthanized after a long battle with peritonitis. 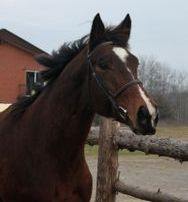 This little man was such a sweetheart and we had big dreams for him as an upper level dressage horse. 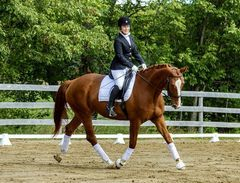 Quater Karat "Kara" born in 2017 and sold to a professional USA FEI dressage rider. 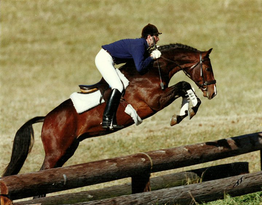 Cadbury is a Canadian Warmblood by Hilton GS/Wellington II. 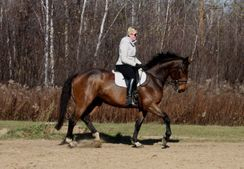 Cadbury is 16.2h and big bodied, with gorgeous uphill movement, a fantastic top line and powerful hind end, with a kind and gentle disposition. 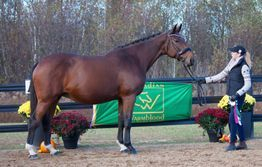 Cadbury was presented to the Canadian Warmblood Association and scored top marks, earning her Premium status with many compliments on her conformation and type. 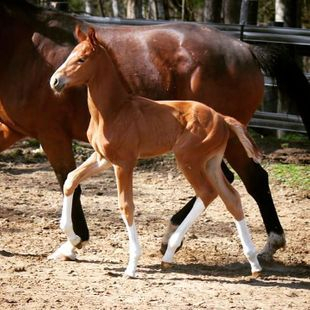 She had her first foal April 2015 by Fabregas, she has proven to pass on her lovely topline, type and movement. Her 2015 filly who also scored top marks at her inspection. We were so thrilled with the combination that we rebred her to Fabregas for a lovely 2016 filly. 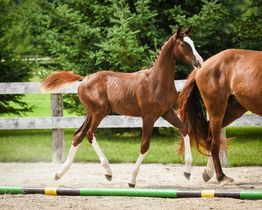 Cadbury delivered a gorgeous foal by Aloha in April 2017, who sold to a national level hunter rider. 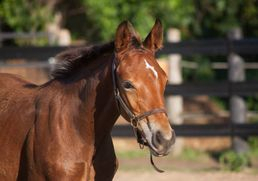 Cadbury has been sold and will continue to produce foals for her new owner. Monika is by Merlin/World Cup IV. 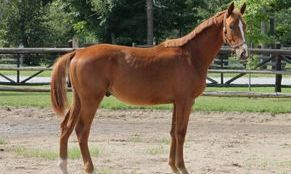 She is a big bodied mare who consistently produces athletic foals who are beautiful and versatile. 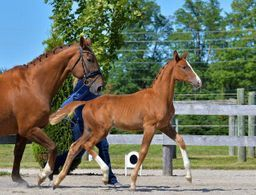 Monika is Hanoverian Verband approved for breeding and has produced three lovely foals for us. 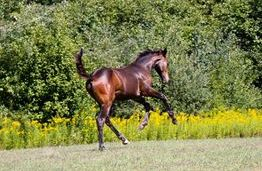 The combination of Monika and Glorioso Noir was so successful that we repeated it, and are keeping her first of that combination for our breeding program, Gold Digger. 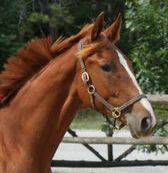 Monika is sold and no longer part of our breeding program. 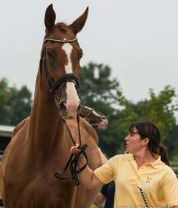 Merlin (Reg name Magic) was reserve champion at his performance test; ranked 1st in jumping, and 2nd in rideability. 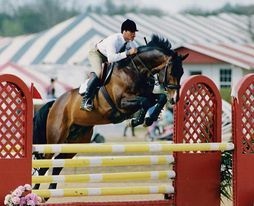 Merlin competed in the jumper ring by Grand Prix rider Chris Pratt. 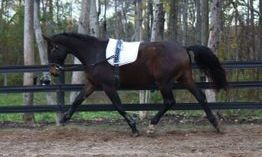 Merlin produces horses with beautiful heads, classic looks and outstanding form over fences. 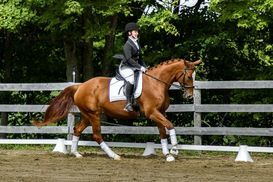 He is by all accounts a very versatile stallion, his offspring are suitable for dressage, hunter, show jumping or eventing. 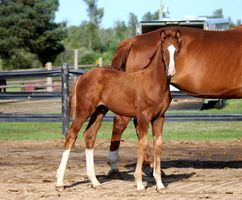 Monika has been sold and will continue producing foals for her new owner.